Logos were generated using the GNU Image Manipulation Program (GIMP). The GIMP image files (xcf format) are available for download. Shown below are the corresponding images converted to png from GIMP xcf files. Please copy the images and post them liberally around your web sites! The `CLUE' word in all logos is the Roostheavy font. BLUE - Red 120, Green 138, Blue 174 (256 scale) or hex #788aae. If you would like to build and contribute CLUE logos, please send the submissions and images to the webmaster. To preserve layers and formatting, we prefer GIMP xcf files, rather than flattened png, jpg or gif. The banner is 458 x 68 pixels. 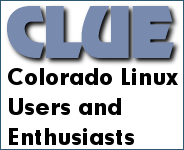 The `Colorado Linux Users...' words in this logo is the Geometr706 md bt font. Click here to download the GIMP xcf file. The box is 184 x 150 pixels. The button is 184 x 72 pixels.